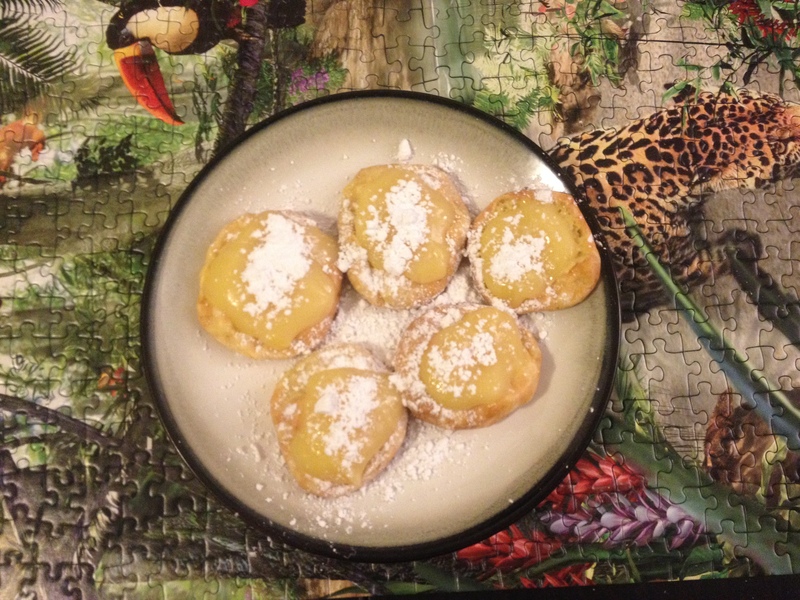 Last week savory puffs, this week dessert puffs! Like I said last week, clearly I had to work on my puff-making technique. Obviously though it would be silly to make the same type of puffs. So I was mulling about it, and I thought the very basic base should pair well with something super intense, namely super-lemony lemon curd. I’ve made lemon curd several times, and I’d made the puffs before, but I never combined them, so I declared that it qualified as a new recipe. Beat the eggs, egg yolk, and sugar in a bowl and set aside. Heat the lemon juice, butter, and milk in a saucepan until almost boiling. Remove lemon juice mixture from heat and add to the egg mixture a little at a time – extremely slowly and carefully. Once they are all combined, return the entire mixture to the saucepan, and cook it on medium heat until it gets thick. Add the vanilla. Pour into a bowl, cover, and stick it in the fridge. While the curd is chilling, make the puffs. Heat the butter and milk together in a smallish saucepan. Bring to a simmmer, then turn off the heat. Add the lemon zest and stir. Then dump in all the flour and mix. It should form a fairly coherent, smooth dough. Let cool for a few minutes. Crack an egg into the pan, and mix it into the dough. That will be seriously difficult. Then add the second egg. It will be slightly easier, although still require effort. The dough might still be lumpy after awhile, but as long as the egg is thoroughly mixed in, it should be fine. Stick the choux paste into a quart-sized plastic baggie and cut off a corner. Squeeze some of the flavored choux past onto a baking sheet in a circular shape – maybe 2 tablespoons worth. Bake at 400 for 15-20 minutes. Transfer to a cooling rack and serve warm. Ok, so this time these guys puffed really well – yay! but much like a souffle or a yorkshire pudding, it immediately collapsed once it was out of the oven. See, the plan was to cut them in half and fill them with the curd, but they were too hot to cut and fell too quickly. So I just dolloped some curd onto them, and then sprinkled the whole thing with powdered sugar. The result was pretty good. I mean, it was really good, but I love lemon curd and there are so many other things to do with it that I rather like more. Fortunately the above recipe makes a lot so I will be having my morning toast covered in butter and curd for a while. Mmmmmm. Song of the week: Why Do You Love Me by Garbage. Solid rock, with an actual woman singer – women rockers are constantly under-appreciated. And this song has just fit my mood perfectly for the past few days.